With the Hangman, I just made stuff up. But I couldn't fabricate stories about the actual British Redcoat uniform. I found myself curious about what each of the elements on the uniform were for. I got lost in the research! That's a fascinating outfit! On top stands my LEGO re-creation of the Provost. 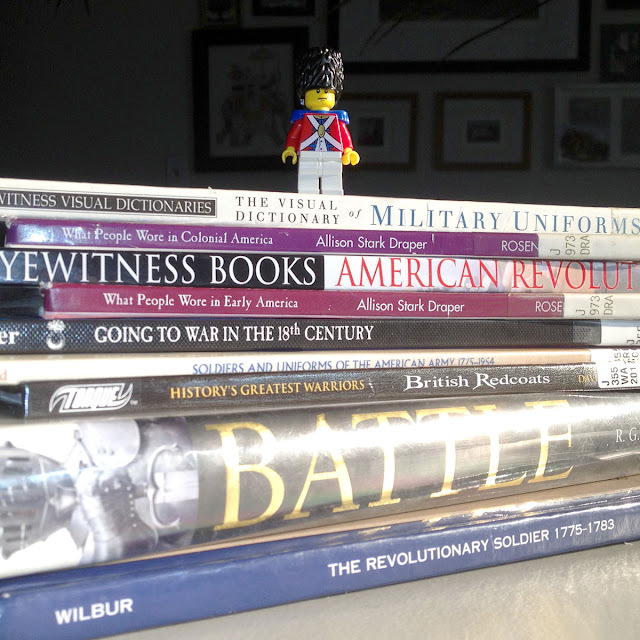 LEGO doesn't make a 1776 Grenadier's cap. They do a nice Tricorn, an Admiral style Bicorn, even a Napoleonic Shako, but I had to make due with the modern Bear-skin Palace Guard hat. That was the closest. Yay! I was about to comment asking if we would get to see a LEGO Hazardous Tales crew like you made for the Calamity Jack release, and then I saw this post. I love the Provost's costume! I can't wait for more. I just love that you transform it all into lego art. Oh lord, you think it was tough finding the hat - try recreating African American characters in LEGO! Damn Danes. There are exactly three brown LEGO heads - a werewolf, Lando Calrissian, and a zombie pirate. Not to get off topic - great job on the research, Nathan!